The project provides for the construction of an office and residential building of a mixed type, consisting of residential and office sections. It is located in the immediate proximity to Sky City Center and Kosta Loulchev Street. • will include office and residential areas with GFA of 7142 sq.m. • will be devided into two sections with separate entrances and communication. • consists of a ground floor with shops, public sites and five residential storeys. 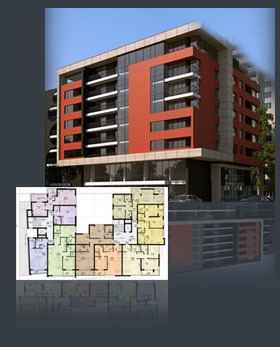 The building "Electronica" is designed to have 50 flats, for more information please click on. • The perfectly designed functional schemes allow for flexible planning of interior spaces, according to customers'wishes. • The greatest number of flats occupies a floor area of 65 to 75 and 80 sq.m. • The apartments are constructed with high-quality building materials and modern technologies, and meet all European standards. • The convenient underground parking lots make it easy for residents to park their cars. The building "Electronica" is planned to be designed and constructed by December, 2012.